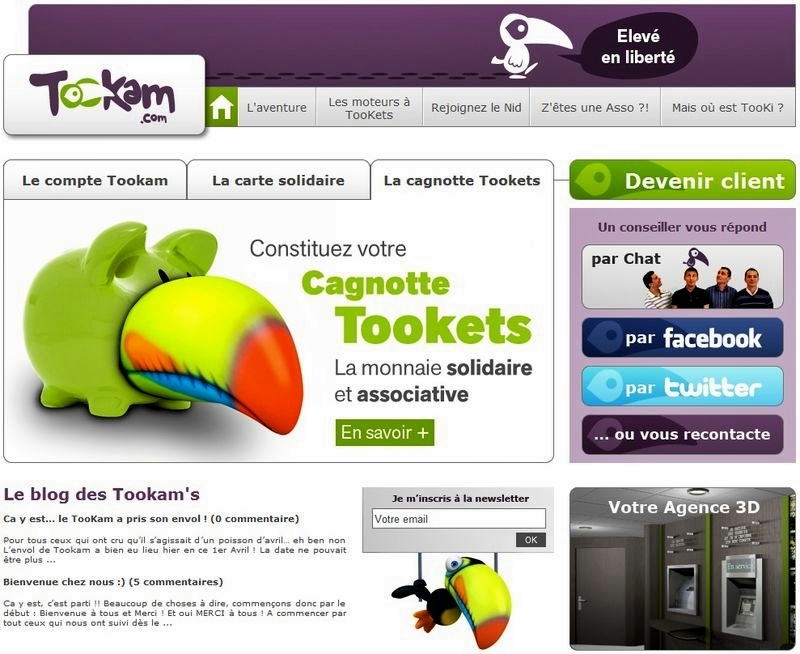 TooKam.com is the latest innovative project launched by Credit Agricole Pyrenees Gascogne, one of the 39 French regional banks in the Credit Agricole Group, under the leadership of its CEO, Jean PHILIPPE. Jean is a passionate leader, and one of the greatest supporters of social media in the banking industry. He is an active blogger and tweep which demonstrates his willingness to understand new people’s expectations and behaviours, reach out to them wherever they are with the right tone of voice, and lead by example at his bank. I invite you to watch my video interview with Jean (in French). So what is TooKam? First of all, don’t underestimate the importance of this project based on its birdy name or its launch date on April’s fool. TooKam is basically a(nother) virtual branch launched by a traditional bank, but with a twist. This new bank aims to be more approachable, transparent, engaging, and to give back and drive charitable behaviours. Jean is keen to prove that it is no marketing campaign but a sincere and honest try at changing the industry and making it more human and centered on the clients and the people in need. The whole project is based on an active presence on social media and the use of a virtual / social currency. In addition to call back and web chat, the Team, made of passionate social media enthusiasts people, will engage with you on facebook, twitter, and via their blog and their own virtual world. As you’d expect, I had to try the chat feature on the launch date! I had a great chat with Damien who proved to be responsive and helpful. This chat is a step forward ASB Bank’s own facebook chat launched back in September 2010. Not only you don’t need to install an application, but you can export your conversation or ask a question even outside opening hours. By the way, it is a clever way to capture email addresses. If you are interested, I invite you to check how the email export looks like. On the less positive side, you still don’t get much background information on the agents, and I wonder how secure people will feel in this environment. For the time being, the team is using theirtwitter account to re-tweet mentions of TooKam on the popular microblogging service, give more exposure to the blog posts covering the initiative, and invite people to interact on their facebook page. Unfortunately @TooKam was already taken, so make sure to follow @TooKam_. Jean has been convinced of the value of virtual worlds for quite some time. So it comes as no surprise to be able to interact with the Team in a 3D branch. Jean and his team know how important it is for virtual worlds to work to be easy to install and quick to get started. Here you just have to install the light client CA PG has been using as part of their recent 3D internet experiments. TooKam doesn’t have a dedicated mobile application just yet. For the time being, they promote Credit Agricole’s highly popular iPhone app, “Mon Budget” (My Budget). Your success in social media lies in your ability to convince of the value of your initiatives and REWARD your members/fans/followers for visiting, contributing, promoting your initiatives. The cornerstone of TooKam is to leverage a virtual currency named Tookets. The bank created a standalone programme offered to charities, associations and companies to reward their members and clients and give back. They also launched a dedicated twitter account and facebook page. TooKam is the first programme live. Basically, the more TooKam’s clients are saving or using their card, the more Tookets they earn. They can then redeem those tookets to support an association of their choice. * Card: earn 8,000 tooklets or more per year based on your usage. The participating associations and charities are still to be named on the site. I’ve started monitoring social media activities in banking and insurance four years ago, and in the last 18 months I’ve noticed a surge of social media initiatives from banks thoughout the world. At Visible Banking, we are now tracking 1,350+ twitter accounts and 770+ facebook pages and apps in over 70 countries. Real innovation in social media is rare, but some banks have been experimenting more than the others such as Vantage CU with their online banking service on twitter, ASB Bank with their “virtual branch” on facebook, or Deutsche Bank and their Q110 branch on Second Life. In the last 12 months, the focus shifted towards customer support with a lot of initiatives from banks like Citi (AskCiti on twitter, Jaime Punishill and Frank Eliason), Caja Navarra (Cancha 24), Lloyds TSB(@LloydsTSBOnline on twitter) or BNP Paribas (@BNPPARIBAS_SAV on twitter). Also considering that people have been earning, buying and trading virtual currencies for years, you might wonder how innovative this initiative from “a small French regional bank” is? First of all, the vision and the passion are unique. Jean is committed to change the banking industry. He aims to successfully leverage social media, with a key focus on people and proximity, to change people’s perception and build an engaged community of “client advocates”. This is a typical example of client-facing initiative which would have never happened without the influence, the conviction, and the leadership of a Senior Executive. The Credit Agricole Pyrenees Gascogne has been using virtual worlds, blogs, twitter and facebook for quite some time now. Jean and his team are using all their hands-on experience and their passion for those channels to provide the most friendly, honest and transparent and convenient experience online. For instance they experience with virtual worlds reminded them how important it is to make it as simple as possible for people to join the conversation and use those new media, hence the light 3D world client and the facebook chat. I’m not sure how receptive French people will be, and how willing they are to make positive contributions to the community. Fact is success here doesn’t reside in terms of number of clients or profit generated. With this initiative, the Credit Agricole Pyrenees Gascogne sets the tone in social media. They demonstrate that the French banking industry became one of the most engaging online within the last 18 months. Last but not least, with this experiment (led internally) the Credit Agricole is a step ahead of the competition: they will dramatically increase their abiltiy as a company to adapt to any major future shift of communication, always connect with their market and meet higher and higher customer expectations. They are self proclamed “the friendliest banking branch on the internet”, and I truly believe they are committed to living up to those high expectations. Everybody agrees on the fact that financial institutions are no Apple or Amazon, and they can’t have raving fans, would you agree? You know what, with this initiative I believe Jean and his team have a good shot at proving people wrong. So if like me, you are eager to find out how successful TooKam is, and how passionate, engaged, and vocal their clients will be, stay tuned on Visible Banking! So still not sure what TooKam is: Is it a rEvolution? Is it a Bird?… It’s a rEvolution!